In The 18th century, tea was a very expensive commodity,as valuable as gold! The tea was stored in special containers with locks, to which the mistress of the house held the key. Fruit shaped tea caddies were made out of fruit wood. The rarest and most collectable shapes are the apple and pear. 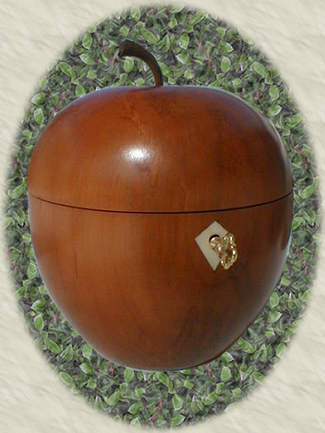 This fruit shaped tea caddy replica is made out of pear wood imported from Europe. Display this rare tea caddy on your Chippendale and Queen Anne tea tables. We are pleased to offer an opportunity to own this hand made and hand finished reproduction of a rare and highly collectable 18th Century tea caddy. The original is extremely valuable and a highly sought after period furniture accessory. This impressive and unique wooden container, with faux liner, made of rare, solid high quality European pear wood was carefully selected, aged and cured. The faux ivory and diamond shaped key escutcheon plate is carefully inlayed over the fully functional lock with brass key. A solid brass stop hinge supports the lid which is topped with a hand carved fruitwood stem. Custom made-to-order, made in USA. Please see our many other antiques for more interesting items. ...Thank You for viewing our ad! "Antique Apple Tea Caddy" furniture accessory 5 × 6.25 inches tall, = Prices.